One of my favorite months of the year is over. Halloween has come and gone. And I have not posted a single thing related to squash, pumpkins, or the host of phenomenal sweet and savory delights that I enjoy making with them. This post may be a little tardy for those of you not experiencing the golden summery autumn days of the Bay Area, and thus, I assume, beyond the season of fleeting sunset yellow squash blossoms, but you can pocket it for next season. 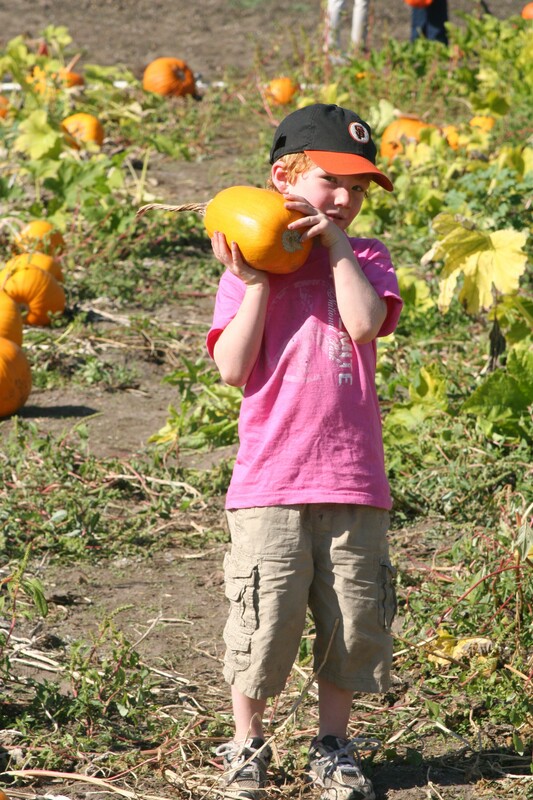 If you intend on visiting a farm for a fall U-pick or somewhere that grows its own squashes, you will likely notice that many of the pumpkin plants are still producing massive edible blossoms. My advice is to ask the farmer if you can pluck a few and bring them home with you (and it is always nice to offer some money). 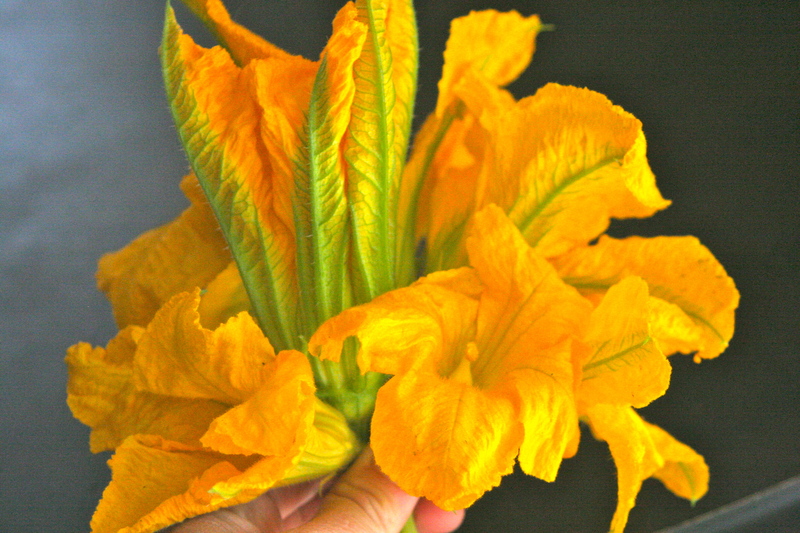 The squash vines that we have not already uprooted in our back yard are still producing twenty or so blossoms a day. They open a couple of hours into the day and have closed by the setting of the sun. Part of why I love this year, is indeed, related to all of the “winter squashes” available. Put simply, I adore the sight of orange pumpkins and the variety of wrinkly, rosy, warty, green, white, and even curly squashes makes me giddy. 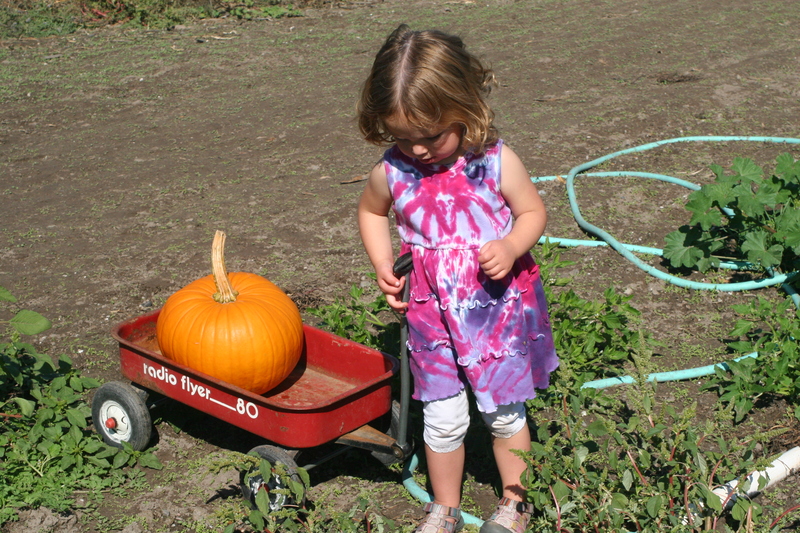 Indeed, all of the varieties that we grew in our garden, and half of the pumpkins that we picked up at a favorite Petaluma farm a couple of weeks ago are edible. However, since the sugar pie pumpkins, rugosa, red kuri, and butternut squashes will last for another couple of months, I will restrain myself for another week or so (excepting, of course, the chickpea-pumpkin salad with Israeli couscous that I made last week). 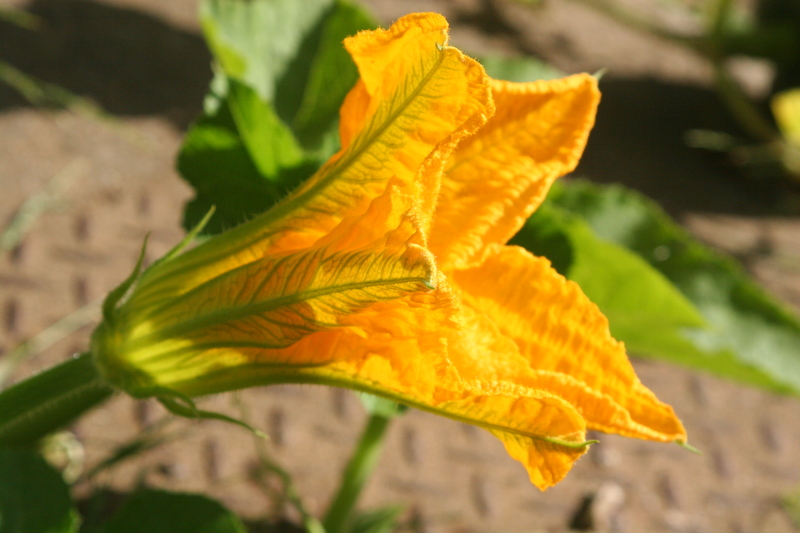 For the months that you could keep a squash on your kitchen counter, however, the blossoms come and go within the rising and the setting of the sun and most plants stop producing and wither up by November. One of my new favorite ways to prepare them is a perfect and simple harvest dinner, since one can combine it with favorite end-of-the-season mildly spicy peppers. 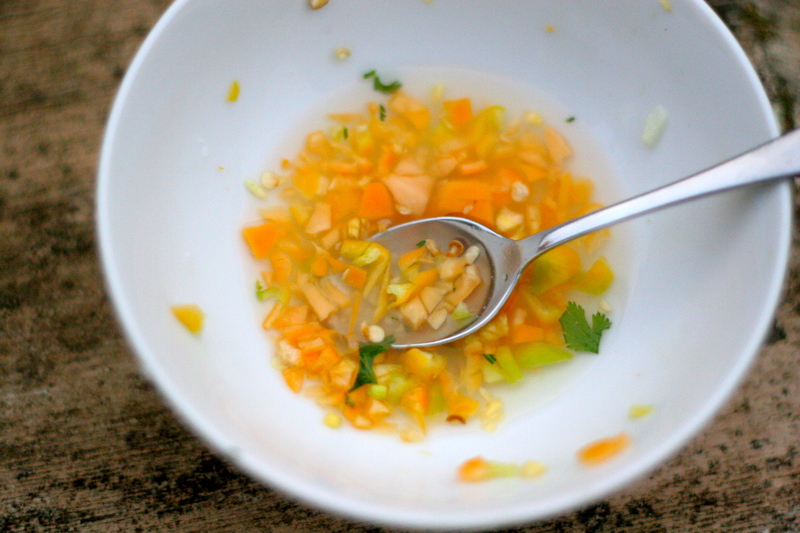 The salsa too, while utterly simple, can be omitted for the quickest of meals. I made a version of a Yucatan salsa that I adore and drizzled it on top of the quesadillas right before eating. *If, however, you have a certain, ahem, cheese and pepper averse child who would much prefer the pumpkin already, homemade tortillas with a little melted butter and pumpkin blossoms will delight them while you indulge in the rest of the harvest meal. Saute the onions on medium heat until softened and translucent, about 5 minutes. Add the poblano peppers and squash blossoms and a sprinkle of salt. Once the peppers are cooked to your liking, take the pan off heat. In a separate frying pan or comal, heat a tortilla on medium heat. Flip after 1 minute and sprinkle a bit of cheese on to melt. 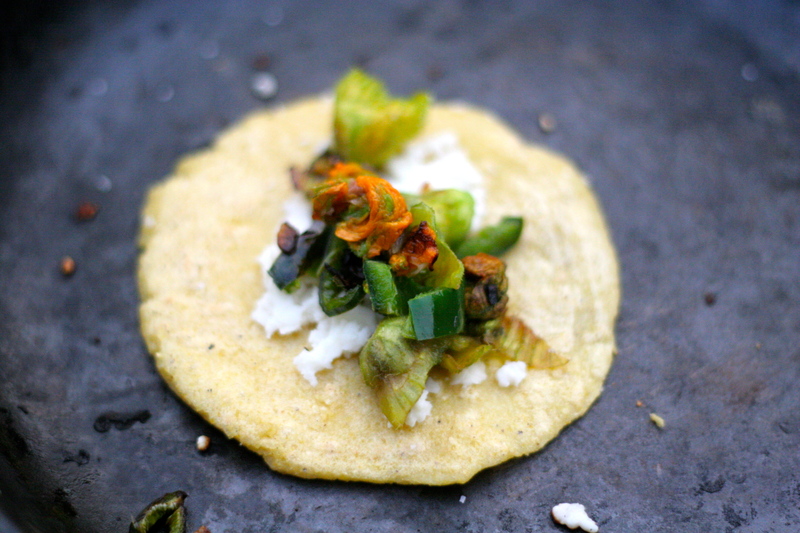 After another minute remove, add the poblano-blossom filling and serve with the Yucatan salsa. Place the desired amount of masa harina into a heatproof mixing bowl. Slowly stir in just enough hot water to make a barely wet dough. Cover with a towel and set aside for 20-60 minutes until ready to pat out tortillas. Line a basket or bowl with a clean kitchen towel to receive the just-made tortillas. 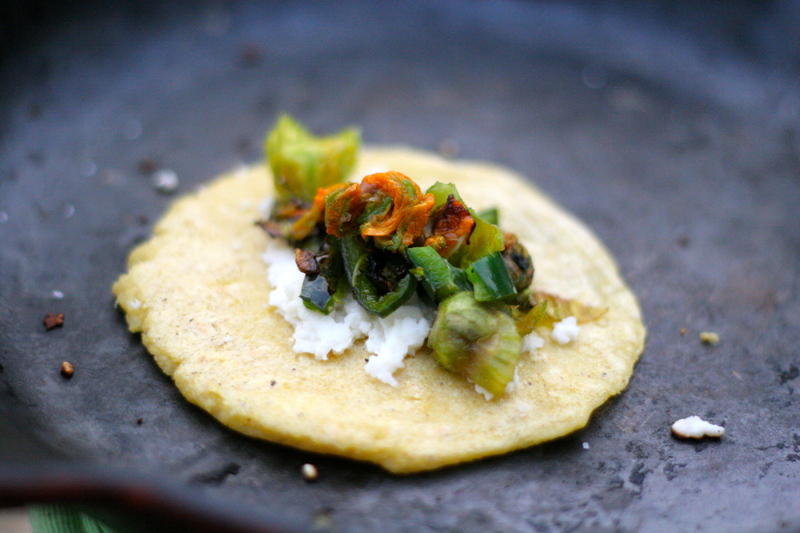 Using a tortilla press or a sturdy frying pan upon a clean flat surface, make your tortillas. To do this, I recommend using two flat, clean plastic bags, placing a 1 1/2 inch ball of tortilla dough between the bags and pressing down with the tortilla press or with your home-rigged system. Heat a comal or cast-iron skillet to medium and cook the first tortilla until the edges just begin to curl up. Immediately flip the tortilla and cook for another 30 seconds on the other side. Flip back to the original side and cook another 30 seconds. Place the tortillas in the towel lined basket and cover until finished making all of the tortillas. Mix all the ingredients together. If you desire a more smooth salsa, work the solid ingredients in a mortar and pestal and slowly add the wet ingredients. This entry was posted in Dinner, Inept-but-Earnest Cook's Night, Whole Grains and tagged Gluten free quesadilla with blossoms, homemade tortillas corn, how to make tortilla from masa harina, pumpkin blossom recipe, quesadilla with poblano peppers and squash blossoms, quesadillas with poblano peppers and pumpkin blossom recipe, squash blossom recipe, what to cook with pumpkin blossoms, what to cook with squash blossoms, Yucatan habañero salsa. Bookmark the permalink.